Local SEO isn’t just a way for small businesses to get visibility ahead of larger competitors. It’s about generating highly-qualified leads from people in your nearby area who are close to making a purchase decision. And it’s also one of the most effective channels you’ve got for driving in-store visits from online search. To make this happen, you need to be showing up in the local pack of results and Google Maps. Otherwise, you’ve got a problem. 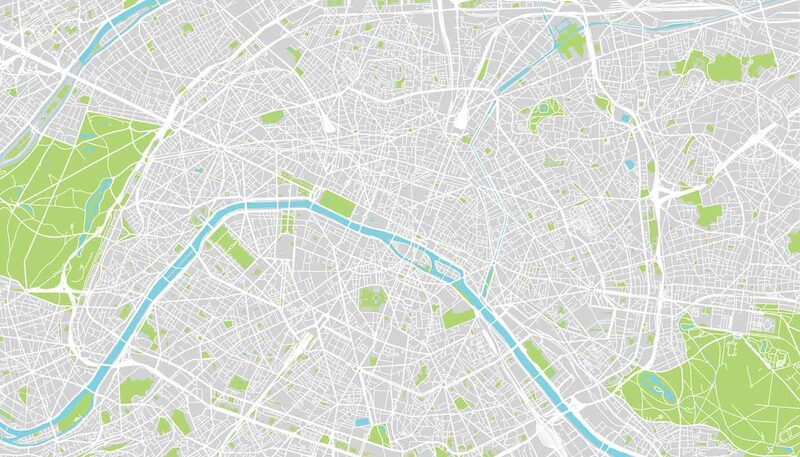 So here are the key three reasons your small business might not appear in Google Maps and how to put them right. Before your business can show up in the Google Maps feed and local pack of results, you need to set up your Google My Business account. Now, it’s important you don’t rush this because filling this out correctly is absolutely vital to your local SEO efforts. Hit the START NOW button on the Google My Business page and you see the following form pop up. One of Google main concerns with local listings is accuracy. It wants to confirm that your business details are 100% consistent, everywhere they appear online. As things stand, this is the best method Google has of verifying that you’re a legitimate business and not some kind of Google Maps spam. So here’s the deal – the details you type into the fields of that form above must be exactly the same as your business appear elsewhere online. Let’s say your business name is Rockstar Bakery. Don’t have it appear on your website footer as RockstarBakery and then add the space when you type it into Google My Business or anywhere else. Choose a single format and stick to it. Also, make sure you don’t switch from St. and Street or other abbreviations; choose a single format and stick to it. This might sound over the top but inconsistent NAP details (name, address and phone number) will prevent you from showing up in Google Maps. So decide on a single format for your business details and stick to it. Aside from accuracy, the other key thing Google wants to determine is relevancy. This is where choosing your business categories wisely is so important. You’ll be asked to enter your primary category in the form above but you can add up to ten additional categories on your Google My Business landing page, which helps make your business more relevant to local search intent. For example, you can add cake shop, coffee shop and tea room as secondary categories – as long as you actually provide the services you claim. 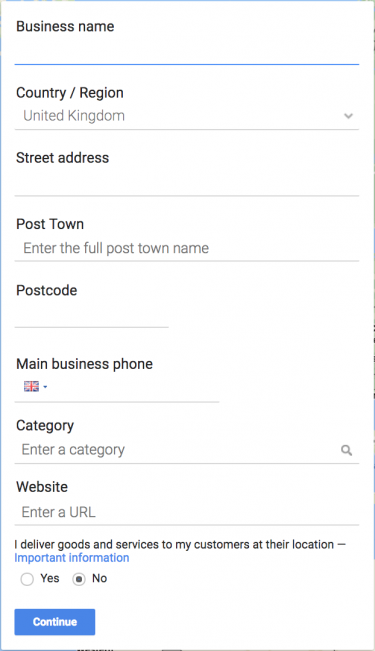 Next, you want to verify your location in Google Maps and fill out as much information on your Google My Business page as possible – opening times, days of operation, etc. The more info you can provide Google, the more it has to work with in terms of matching you up with relevant searches. You don’t want potential customers coming to pay you a visit on Sundays if you’re not open. If you are actually the proud owner of a bakery then you have plenty of material for images. Invest in getting some quality pictures of your building, the interior and – of course – your tastiest products. Not all small businesses have it so easy, though. If you’re a recruitment agency, for example, the key is to make your business look as professional as possible. Don’t use any cheesy stock images or iPhone pictures of your brick cast building on a cloudy day. Set the tone with your images and create an inviting Google My Business page that encourages people to walk through the door. With your Google My Business account fully set up, it’s time to think about your website – and it really is a good idea to have one. Not having a website won’t stop you from showing up in Google Maps entirely but it will hurt your local presence. Google uses the information on your website (among other sources) to verify your business details and not having a site removes this important reference. One of the things Google wants to see from your site is a dedicated contact page, filled with all the same business details you entered into your Google My Business account. Now, most small businesses have a single location but this isn’t always the case. For example, a marquee company will often have one site for manufacturing, one for hire and perhaps a separate showroom at different addresses. If you happen to fall into this category of small businesses that operate across more than one place, you’ll want to create a separate page on your website for each location. Include your location name in the page URL and have all the necessary NAP information in the main content for each page. Then, you’ll want to link each location page to the locations you’ve listed in your Google My Business account. If you only have the one business location, you can simply link to your homepage and leave it at that. That last point couldn’t be more important. It’s not much help linking users to your website if it’s poorly optimised for mobile or too slow to load on a mobile connection. The vast majority of local searches start on mobile, so make sure you’re up to pace. Off-site SEO may not be something that springs to mind when you think about local search, but it matters – a lot. Aside from some localised healthy link building, there are two key things Google wants to see; customer reviews and your business present on third-party directory listing websites. Let’s start with those directory listings first. These are “other sources” I mentioned earlier that Google uses to confirm your business details and determine that you’re a legitimate business listing for Google Maps and local results. So get yourself on Yelp, Yell and other trusted directory sites. Once again, make sure your business details are 100% consistent or you’ll end up doing more harm than good. Next, you want to think about building a profile of positive reviews on Google Reviews. Aside from telling Google you’re a business worth listing in local results, a collection of positive feedback drastically increases your chances of generating leads from nearby users. 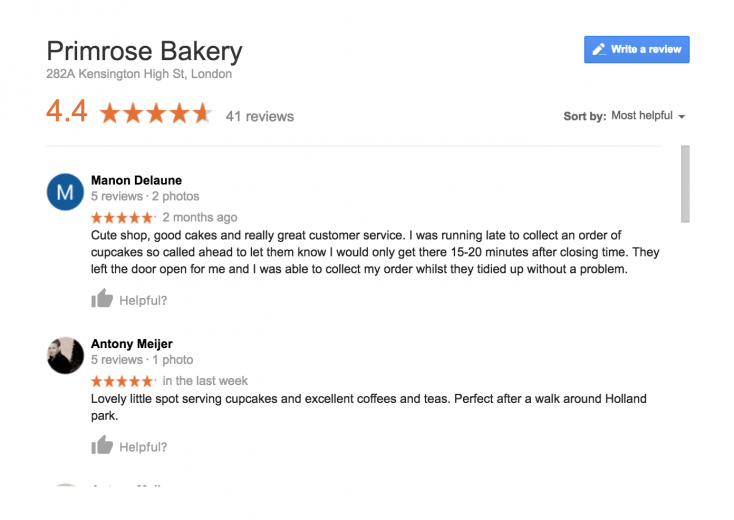 So encourage your existing customers to leave feedback on Google Reviews. Getting your small business to rank in Google Maps is a local search priority but it’s not the only thing to focus on. You still want to think about backlinks and brand citations – especially from local, authoritative sources. If you can’t produce the kind of content that naturally attracts links, then get involved with the community and local sources that are likely to mention your efforts. Finally, be sure to keep up with the latest developments in local SEO because Google still has some work to do here. The search giant still needs to improve the way it deals with spam listings in Google Maps and local results – so you can expect more changes to come. Need help to rank in Google Maps? Then contact our SEO experts today on 023 9283 0281 or submit your details here and we’ll call you.